I found much of 2013 was spent searching for directions and finding where I fit. Exploring opportunities and talking to many (many) people allowed for a level of self-understanding that I cannot be more blessed for. Knowing yourself, your skills, and what you can bring to the table is invaluable wherever you want to be. Of the many changes that are set to roll out this year, the most evident one is my work. 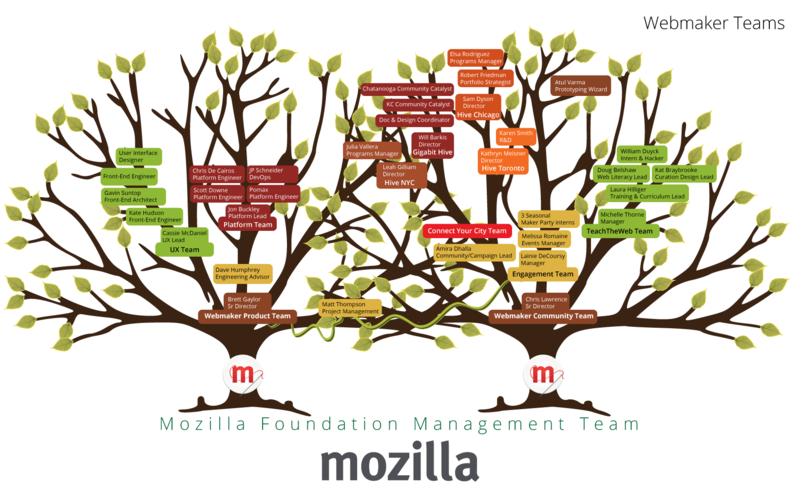 Mozilla Foundation is changing. Along with growing at an unprecedented rate, the organization is evolving to become more focused in what it does and the way it does it. I’m excited to be apart of the new changes but as our strategy and objectives change, so do mine. Dear 2014, let me introduce you to the new community and campaigns lead. I’ve been asked to do a reflection on my new role, the team and our upcoming workweek. In the spirit of being open, it’s going to live here for all you to read, comment and challenge my theories. I strongly urge you to do so. Part 1: All roads lead to community. It’s not a coincidence that I have community back in my title. I work with the people. Wait, make that for the people. The first time I earned a title as community manager was now a distant ten years ago when I managed an online community along with programing consumer research surveys in order to gather insight for top tier brands and companies. Tech + Communities. It seems I have a niche. For the past ten years I have found myself continuously coming back to community roles. I tend to blame it on my desire to tell stories. I take a story and help others to understand and feel connected to it. Part of being a good storytelling means taking anyone’s story and telling it as if it were your own. In the past six months with Mozilla, my favourite part has been sharing the stories of our community and what, or rather how they have accomplished it. Similar to stories, I attribute my relationship to communities on my desire to work with people and support them. I’m generally a positive person and I try to use that energy to help people and make them feel as if a person (not a brand or company) believes in them. Individuals, myself included, are constantly looking for reassurance from others and I want to be the person there to provide support, encourage, and challenge them to go further. This involves turning our community members into evangelizers of our work, allow them to bring in new community members and in turn create contributors out of new community members. I’m driven by my passions. I don’t work for a cause unless I’m passionate about it and spreading that energy among others is what I love. Unlocking that inner passion and giving others the resources to make changes with me is riveting. In a non-for-profit, rallying groups towards backing a cause is critical to its success. I support a web-literate world and want to help others understand how they can teach and learn others to become web literate. This is where my strengths lie and this what I bring to the table for Mozilla in 2014. I’m excited to take on many campaigns in 2014 (along with Maker Party) and lead our community to action. My title might be changing a bit but I don’t think the role I’ve been playing will change much. I’ve always worked deep with the community, shared their stories and encouraged their success. The main changes will be seen in working with our now solidified community contribution levels and building deeper engagement strategies around them. Going from 2013 to 2014, one must think as to how we can improve our processes going forward. I listed a bunch of Maker Party suggestions in this blog post I released not too long ago. We’ve got great events like Maker Party and Mozilla Festival that are very consumer-centric and great places to teach, create and test. With the successful 2013 localization efforts it will be interesting to see how we can further develop our events in different cities and create more local-specific campaigns. Also, as someone who now owns support for Webmaker and Maker Party, which for the most part is available in many languages, I’m starting to learn that our community is asking for support in languages I don’t understand and can’t respond in. Learning how to be adaptable to our many different communities is something we can work towards. Dogfooding is important. More importantly, it needs to be done by everyone. Understanding our products and our users needs are best done by being the users ourselves. Let’s preach what we teach. CRM. We gain a lot of new users who attend events. We have the ability to capture those users and turn them into contributing community members. After all, the best way to learn is by teaching. Emailing. Totally missed opportunity of 2013. We don’t email our community (and I mean our whole Webmaker community) as often as we can highlighting successes among our community members and product updates. With the community call phasing out this is vital to our culture of open and would be a good way to engage new users. Learning from numbers. Seemed confusing in 2013 what we were measuring and whether we were achieving it. Something that would be cool (and open) would be a live board with Maker Party numbers around the world. Marketing ourselves. I’m a firm believer that Webmaker is a product that can change the world but I feel 2013 was missing the right tools to market our product and position it as the game changer it is. PR for campaigns. Though we did gather great press for Maker Party in 2013, there could have been a better outreach done before and during (amiright Erica?). Mozilla has always felt like a start-up, much of which is attributed to feeling like a community rather than a workplace. It’s got the culture of a start-up and social enterprise, which is what I, and on-lookers, admire the most about the organization. Our team is made up of a bunch of work-hard do-gooders. Keeping this culture and start-up mentality is something I hope it never looses. We’re a family that celebrates and works hard together, while always putting our community first. In 2013 it felt like we spent a lot of time trying to understand our users and what their needs are through prototyping, user testing and researching. Doing this is critical. Our users should be the ones to dictate our actions rather than our beliefs. And our work, thoughts and action should always remain open. Being encouraged to share our ideas, positive or not, in an open fashion, much like this assignment, should be continued (hat tip to Erica and Geoffrey). Tomorrow I head out to Vancouver to meet with the new Engagement team and discuss 2014 strategy. Among the many things I’m excited to do is talk further about our community. Other than just understanding them I’d like us to collectively identify what their needs are, our strategy for them in the upcoming year, what motives them, what levels there are (supporter, player, contributor), how do we move them along the levels, and how do we effectively engage them at each level. Also, I’m excited to sit down with my new team and create timelines for our upcoming campaigns, what they’re going to look like this year and how we’re going to engage the community AND partners. Events like Maker Party and Mozilla Festival are no longer in infancy stages. They need long-term direction and plans. Great post Amira! Good luck this year with Mozilla. Sounds like the team is doing great work.